This Trophy Case with Lighting is Perfect for Showcasing Awards! This Display Cabinet is Used by Retail Establishments as a Secure Location for More Expensive Items! 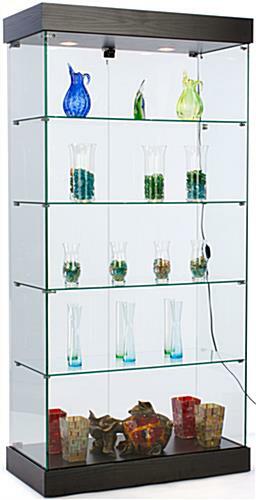 This glass frameless trophy case, also known as a showcase tower, belongs to the EuroVū Simplice series. That means that these display cases are engineered and built in Europe. 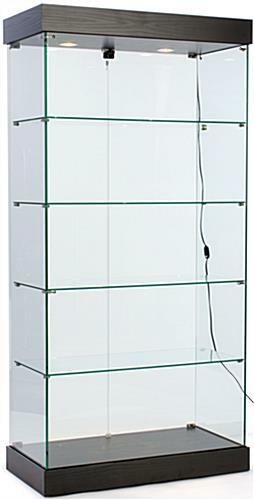 However, this frameless trophy case with wheels is stocked here in the United States, so orders ship within 24 hours of purchase. The European design and craftsmanship of these display cases is a welcome alternative to many fixtures seen in today's stores. 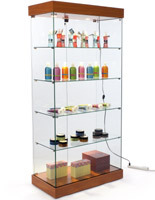 The fact this trophy case is frameless not only provides an unobstructed view of each shelf. In addition, the design enhances the décor of the establishment using the tower. 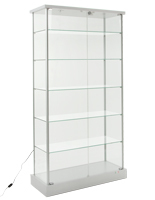 The frameless trophy case that has a black base is ideal for a wide range of establishments, such as a museum, retailer or school. To make these store fixtures more affordable, the base and canopy has an MDF [medium density fiberboard] construction. A black laminate with a wood-grained design gives the base and canopy the look of handcrafted wood. 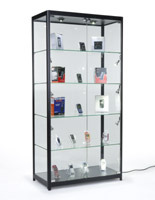 Each frameless trophy case has tempered, green-edged glass shelves, doors and walls. 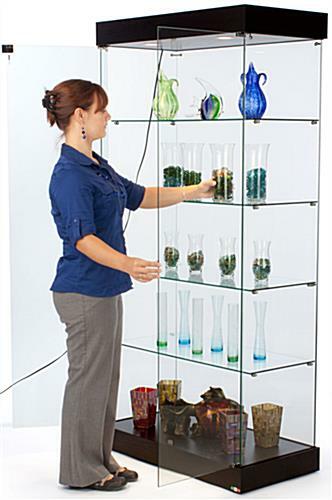 Tempered glass is more durable, and much safer for use in public settings than non-treated glass. The frameless trophy case that is made with tempered glass has lighting inside the canopy. Lighting consists of (2) 35w bulbs which provide the most light to the top shelf, and progressively less light towards the base. 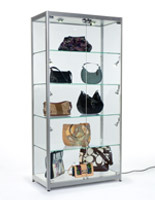 Illumination captures the attention of those passing by the display case, drawing attention to the top shelves. There are four glass shelves within these store fixtures, each with a surface that measures 34-1/2"w x 15"d. The frameless trophy case that has four shelves provides ample space for storing a multitude of items. 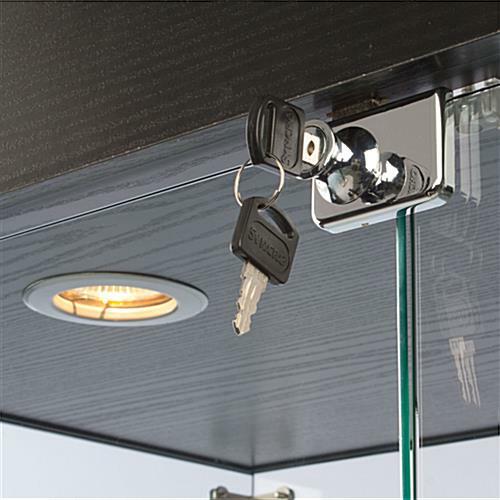 Keys are included for the lock, which is located at the top of the glass doors. There are four wheels on the base for effortlessly moving these cabinets. The base covers the wheels, so customers have no idea these display cases are mobile. 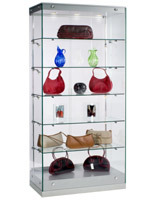 The combination of a European design, tempered glass construction and mobility make these cabinets the ideal choice for displaying goods in any setting! Unique European styling has power cord exiting from top of cabinet. Cord can easily reach a standard 18" high wall outlet or recessed floor outlet, but does require case to be rather close to power source. Shelf Clearance [from bottom to top]: 14-3/8", 12-3/4", 12-3/4", 12-3/4", 12-3/4"